The 2017 Florida Legislative Session ended Monday evening and approved an overall budget of 83 Billion. SB 2500, which is the 2017-18 General Appropriations Bill, provides $23.7 billion in funding for PreK-12 education agencies with $14.7 billion of that coming from the state. The Times/Herald Tallahassee Bureau reports that per-student spending would rise slightly to $7,221 which is an increase of only 0.34 percent, or about $24.49 per student. The Senate originally wanted to increase K-12 spending by about $540 million more than the House proposed under the FEFP (Florida Education Finance Program). Gov. Rick Scott also called for similar large increases in spending. Scott’s and the senators’ plans depended on using additional property tax revenue, which came from rising property values in the state, but House leaders rejected that option saying it would be a tax increase. During the last few days of session, HB 7069 which was originally the House version of the “Best and Brightest” teacher bonus plan became a large and very controversial education policy with a price tag of $419 million. The 278-page bill with numerous policies affecting public education was released Friday, which gave lawmakers little time to review it before making a vote on Monday. 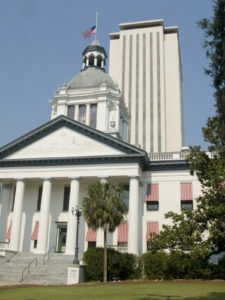 The most notable parts of HB 7069 are the “Schools of Hope” charter school incentives, 20 minutes of mandatory daily recess, limiting testing in public schools, giving school districts more flexibility regarding VAM scores for teacher evaluations and the expansion of the “Best and Brightest” teacher and principal scholarship. The popular mandatory recess proposal by parents across the state, including the “recess moms” that unanimously passed the Senate over a month ago was never brought to the House floor. It was, however, added last minute to HB 7069. The recess proponents spoke out against combining it with other education policy in which they did not agree. They were also opposed to not including charter schools in the 20-minute requirement. If the bill is signed into law, the Algebra II end of course exam would be eliminated, and a study will be conducted to see if college entrance exams could replace some state-mandated high school tests. Also, districts have the option to ignore the controversial state formula based on those tests when doing teacher evaluations. The “Best and Brightest” teacher bonus program will vastly expand under HB 7069. Every teacher rated “effective” on his or her evaluation will get $800. Those rated “highly effective” will earn $1,200. Beginning in the 2020-21 school year, teachers would once again be required to perform well on certain standardized tests. But, more tests would be eligible and the score can now be slightly lower. If a student graduates from college with honors, it will be even easier to earn a bonus of $6,000 a year.